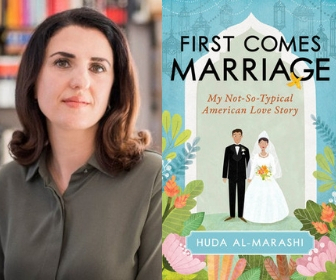 Huda Al-Marashi is the author of First Comes Marriage: My Not-So-Typical American Love Story, a book the Washington Post called “a charming, funny, heartbreaking memoir of faith, family, and the journey to love. If Jane Austen had grown up as a first-gen daughter of Iraqi parents in the 1990s, she might have written this.”Her other writing has appeared in the Washington Post, the LA Times, al Jazeera, VIDA Review, the Rumpus, the Offing and elsewhere. She is the recipient of a Cuyahoga County Creative Workforce Fellowship and an Aspen Summer Words Emerging Writer Fellowship. Huda is represented by Myrsini Stephanides at the Carol Mann Agency. Hadi considers Huda his childhood sweetheart, the first and only girl he’s ever loved, but Huda needs proof that she is more than just the girl Hadi’s mother has chosen for her son. She wants what many other American girls have—the entertainment culture’s almost singular tale of chance meetings, defying the odds, and falling in love. She wants stolen kisses, romantic dates, and a surprise proposal. As long as she has a grand love story, Huda believes no one will question if her marriage has been arranged. Tender, honest, and irresistibly compelling, First Comes Marriage is the first Muslim American memoir dedicated to the themes of love and sexuality. Huda and Hadi’s story brilliantly circles around a series of firsts, chronicling two virgins moving through their first everything: first hand-holding, first kiss, and first sexual encounter. First Comes Marriage is an almost unbearably humanizing tale that tucks into our hearts and lingers in our imagination, while also challenging long-standing taboos within the Muslim community and the romantic stereotypes we unknowingly carry within us that sabotage some of our best chances for finding true love. Huda is available to visit with book clubs (video chat and in-person) via NovelNetwork. Schedule your visit today!